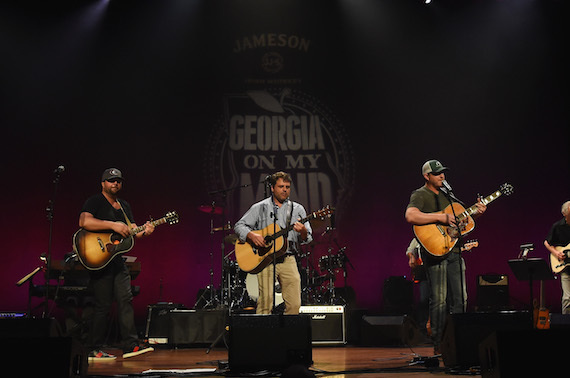 The fourth annual Jameson Irish Whiskey Presents Georgia On My Mind concert, set for May 16 at Nashville’s Ryman Auditorium, will host a solid lineup of chart-toppers and ace songwriters, hosted by the Peach Pickers Rhett Akins, Dallas Davidson and Ben Hayslip. Lauren Alaina, Chris Janson, Kip Moore, Michael Ray and T. Graham Brown are slated to perform, as are Georgia Music Hall of Famers Drivin’ N Cryin’ and Jimmy Hall of Wet Willie. Returning this year are Dexter Redding and Otis Redding III, sons of the soul icon Otis Redding. The evening also includes a special performance by students from the Georgia Pick and Bow Traditional Music School in Dahlonega, who received a grant from the Georgia Music Foundation in 2016 from concert proceeds. “At Jameson we believe music has the power to make a community a family, and we are excited to celebrate and be part of the Georgia-bred music family for the fourth year with ‘Georgia on My Mind,'” said Sebastien Borda, Director, Jameson, Pernod Ricard USA. The Georgia Music Foundation, a non-profit organization established in 1994, has distributed more than $150,000 in grants to deserving music education, preservation and outreach programs across the state in the past three years from “Georgia On My Mind” proceeds. Each year during the concert, the Georgia Music Foundation presents its Flamekeeper Award to a Georgia artist who tirelessly preserves and promotes Georgia’s musical roots and traditions. Tickets, which are available now, are $52.50 and $42.50 and will be available via Ticketmaster outlets, ticketmaster.com, ryman.com or by calling 800-745-3000. Watch a clip from the 2016 concert below.